Ha Tri Hieu is one of the founding fathers of Vietnamese contemporary art. He is a member of Hanoi’s ‘Gang of Five’, the first group of young artists to gain international renown after Vietnam opened up in the late1980s. 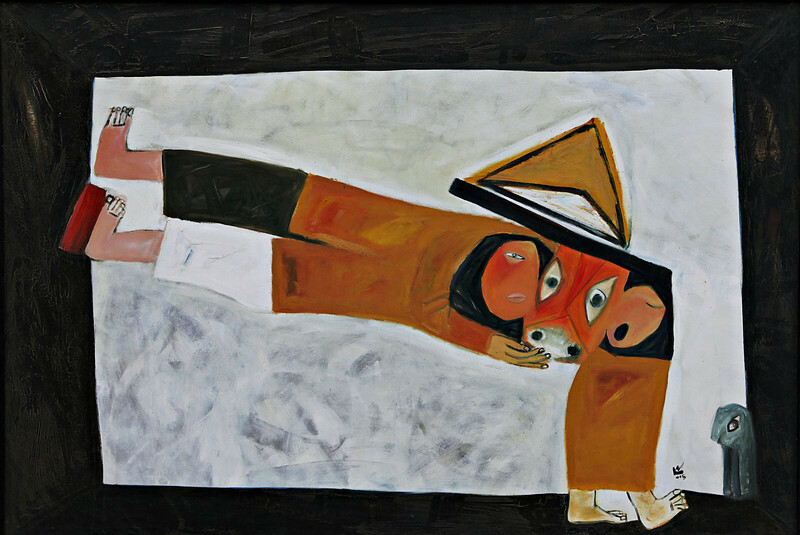 The subject of much of Ha Tri Hieu’s poetic, expressionist work is the beauty and simplicity of rural life in Vietnam. Born in the capital Hanoi in 1959, Hieu was deeply influenced by the years he spent as a child in the countryside where his family sought refuge during the Vietnam War. Recurring images of water buffalos and stone temple dogs evoke feelings of nostalgia and the innocence of childhood. What makes Hieu’s oil paintings unique is the symbiosis between romantic and expressionistic elements, between naïve forms and impetuously chosen colors, combined with a refined understanding of the subtleness of light. Ha Trieu has had exhibitions in Vietnam, the United States, Japan, England, Hong Kong, Thailand, Australia, the Netherlands, Belgium, Norway, Argentina, Malaysia, South Korea and Taiwan.